If you've been prescribed oxygen and if you're a CPAP user, or if you've been prescribed both oxygen and CPAP at the same time, you may be wondering how to go about using both your CPAP mask and machine, and your oxygen equipment at the same time. It's really very easy, and in this article I'll show you the options you have for using oxygen therapy with your CPAP therapy. 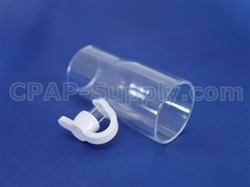 Of course, you'll need the basic tools - CPAP mask, CPAP machine, oxygen concentrator, CPAP tubing, oxygen tubing. In addition to these basic devices, you may need additional CPAP supplies as described below. The first option is to attach your oxygen tubing directly to your CPAP mask. Many CPAP masks have oxygen ports built into them specifically for this purpose. With a CPAP mask that has a built-in oxygen port, usually all you have to do - once you identify the oxygen port - is to remove the port cover and attach your oxygen tubing. See? Super simple. Once the oxygen concentrator is turned on, oxygen flows directly into the CPAP mask. The second option is for CPAP masks that don't have built-in oxygen ports. If your CPAP mask doesn't have a port to which you can connect your oxygen tubing, then you'll need to add an oxygen port - sometimes called an oxygen enrichment attachment - to your tubing connection. Typically, this external or "distal" oxygen port is attached right to the air outlet port on a CPAP machine. Then the CPAP tubing is attached to the oxygen enrichment attachment, making the CPAP tubing with attachment a couple inches longer than if only the CPAP tube were connected directly to the air outlet port on the CPAP machine. The narrow-diameter oxygen tubing is connected to the oxygen enrichment attachment, so that when the oxygen concentrator is turned on, oxygen flows directly into the CPAP tubing. The oxygen is forced up the tubing and into the CPAP mask. Some CPAP users prefer to use an oxygen enrichment attachment even if their CPAP mask has a built-in port for an oxygen tube. For example, if you don't want the oxygen tube near your head - because you've found it to be disruptive or otherwise bothersome - you could use the aforementioned enrichment attachment while still getting the exact same level of oxygen therapy. It should be noted that anytime oxygen is used with an electro-mechanical device like a CPAP machine, it's always a good idea to make safety a top priority. It goes without saying that you shouldn't smoke cigarettes or introduce any type of open flame in the environment around an oxygen concentrator. That's obvious to pretty much everyone. What might not be obvious, though, is the possibility of a CPAP machine being the catalyst for oxygen ignition. It's not likely for a CPAP machine to produce a spark that could ignite oxygen, but there are two precautions all CPAP and oxygen users should take, just to further mitigate any possibility of a fire. First, the CPAP machine should always be turned on before oxygen is turned on. Once the CPAP machine is turned on, then oxygen can be turned on. Second, the use of a one-way air valve can help ensure oxygen cannot flow back into the CPAP machine. The one-way valve - which we call the CPAP Pressure Valve - ensures oxygen will only flow up the CPAP tube away from the CPAP machine and toward the CPAP mask. We highly recommend the one-way valve to anyone introducing oxygen into their CPAP circuit. Using oxygen with CPAP is simple, safe and effective. Using the CPAP supplies like the oxygen enrichment attachment and one-way valve can make using oxygen more convenient and even safer. Feel free to contact us about any of the CPAP supplies mentioned here, or that appear elsewhere on our website. We'd be happy to help you find the right CPAP supplies for your particular needs.